In honor of Shop Small Business Saturday, I am sharing a few of my favorite small businesses in Downtown Frederick. Start: We’ll start at Shab Row, which has lots of cute little shops, but one of the newest (and my favorite) is Primitive Homespuns (120 N. East Street). If you’re even just a little into the whole Shaker look, you will love this place. The space itself is worth a visit, but it’s also packed with adorable items like these hand-made animals! Walk south down East Street and take a right on Church Street. 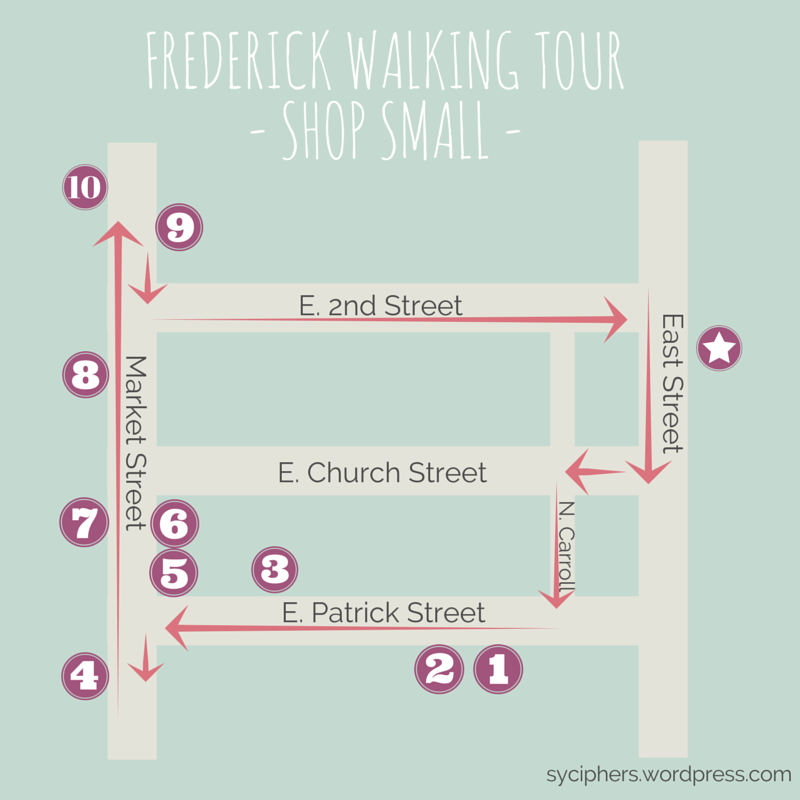 No shops here for this tour, but just one of the many adorable Frederick blocks. Turn left down N. Carroll Street, and after a block, take a right on East Patrick Street. 1) Head into Maven Beauty Bar‘s new (and much larger!) space (118 E. Patrick) and pick up some items for your oh-so-dry skin. Also a great place for gifts for any women in your life. 2) Now that you’ve got the girls covered, walk down East Patrick to Citizen Frederick (112 E. Patrick) to get gifts for the men in your life. It may remind you of Best Made Co. (and that’s a wonderful thing to have in Frederick!) and you’ll find a lot of hip men’s clothing and accessories. Plus the store just looks cool. 3) Time for this kiddos on your list. Head down to Dancing Bear Toys (15 E Patrick) to get fun battery-free toys. (Even if there aren’t any kids on your list, it’s totally appropriate for adults to stop in and explore). 4) When you get to Market Street, we’re going to do a quick detour south to check out the Trail House (17 S. Market). Even if you’re not into hiking and the outdoors, after visiting the Trail House you’ll want to be. Plus the staff has great tips for local hikes, kayak routes, etc. 5) Ok, head back up north on Market and stop in to Voila! (10 N. Market) for loose-leaf tea. My favorites here are Japanese Green Sencha and the signature Voila black tea blend. 6) Next door, you’ll want to pop in to our bookstore, Curious Iguana (12 N. Market). Get a book (or three) or just take a lot of time to browse. They have a really nicely edited book collection. 7) Feeling chilly? Head over to Hunting Creek Outfitters (29 N Market) because he’s been selling Barbour jackets before it was even a brand the M-Street yuppie crowd had ever heard of. Also find a lot of Smart Wool socks and other cold-weather accessories. 9) Probably the newest store on Market Street, Treaty General Store (218 N. Market) is a good spot to find special gifts for those people still on your list. Find hilarious letterpress cards, kitchen accessories, ornaments, and even baby clothes and toys. 10) Cross the street and celebrate! You’ve made it to the end of the tour! Time for some wine. Viniferous (227 N. Market) is the place to go if you want to find a delicious wine (that not everyone and their grandma is already drinking). Tell Bob and Luke what’s for dinner (and your price range) and be amazed at their pairing skills. Looking for craft beer? They’ve got that too. Walk south on Market and take a left on East 2nd Street. Stroll down another one of the lovely Frederick downtown streets until you get to East Street, which is where this lovely Shop Small tour started. Smooth move taking Church and Carroll to Patrick… the post office route is not attractive. My wife and I take this route, but now we will add Citizen Frederick, Trail House, and Treaty Store to our stops. Also, Pretzel and Pizza Creations is a good stop for anyone intending not to cook. Thanks! Yes, Church is much more pleasant. And you could drop in to Great Stuff by Paul on Carroll on the way. Glad you have some new places to check out.